Discussion in 'Guitars in General' started by Rideredder, Mar 18, 2006. My friend prints magazines and he gave me a Carvin booklet. Are these guitars any good, because a couple of them look pretty sweet. I am seriously contemplating purchasing one of these guitars. I'm just looking for some information from people who have had hands-on experience with these products. I was in San Diego a couple of weeks ago and stopped in at the Crvin store. It was the first chance I'd had to play one and I played everything they had there. I absolutely loved the TL60 and CT6M. It was hard to walk out of there without taking one with me. At point I'm probbly going to put together an order for a TL 60. Great build quality in a superbly playing guitar. you may or may not like the pickups but that could probably be said of most any stock production guitar. Beside Carvin offers so many options there that you could probably find something to your liking. Another plus is their liberal return policy. I've had a half dozen Carvins over the years ... great guitars. Carvins are one of the best Bang for the Buck guitars you'll find. For example, you could get a 5A quilt top, birdseye maple board, sperzel tuners, body wood of your choice, fretboard radius of your choice, abalone dots ... for about the same price as an american standard mass produced strat. Or you could get a PRS McCarty quality guitar with a drop dead quilt top, better TOM type bridge, and better factory pickups (IMHO) ... for what, maybe a grand less. So, there you go ... think outside the box. Only thing, don't tell anybody. I live near Sacramento and a Carvin store opened here recently. I had to go check it out as the only carvin I had ever even seen was one with rusty strings in a pawn shop in about 93. I can only say that with Carvin you get what you pay for. You want gold hardware or a Floyd or whatever. My new California Carve top has gold hardware Stainless steel frets, ebony fingerboard with abalone blocks that always look way less impressive in pics on the internet from what I've seen. As for remarks I've read about the pickups I would have to say that they are mostly wrong as I would not consider changing out the pickups. They are high output and when the coil tap is activated still sound better than most humbuckers I've heard. Carvins might just be the best guitars out there in terms of "bang for the buck". The quality is excellent, the playability is excellent, there are a lot of options, the price is reasonable, and their return policy is liberal. What more could you want? Well some would say better pickups and I agree, others like their pups just fine. If you fall into the former category, just drop in your favorite aftermarket pups and you're good to go. Two words of caution. First, the re-sale value isn't very good so be sure you're ordering what you really want - you'll want to be happy with this purchase for the long-haul. Second, know your tonewoods and options before you order (had I done my homework and ordered accordingly, I would still own the first two Carvins I had). 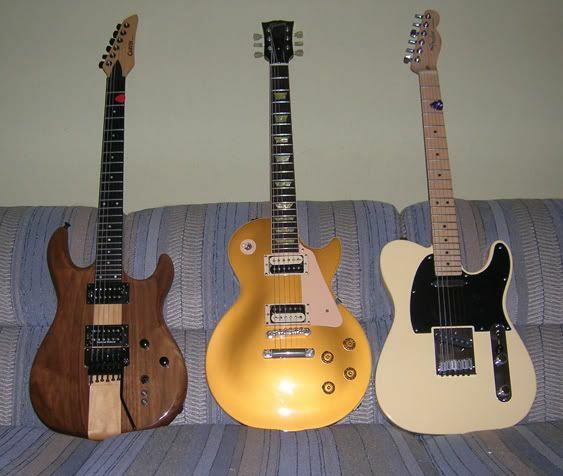 And unlike the dozen or so other guitars that I've bought and sold over the last 4 years, these 3 aren't budging! I bought a Carvin CT4C used a month or so back for a sweet price. Great guitar. I am in the process of replacing the pickups now. They stock ones actually sound good (in fact, the more I played them, the better they sounded) but they look ridiculous (yes, I know I'm a moron ). I replaced them with some Seymour Duncans tonight, which, so far, sound a bit different, but not really better than the stock pickups (they make the guitar look a hell of a lot better though). I'm sure Carvin would sell more guitars and get less flack if they used conventional-looking pickups (just think how many more carved tops they would sell if they offered chrome or gold covered pickups!). I picked up a DC127C from my bass player about a year ago. It is hands down one of the best guitars I have owned. Nexts to my Les Paul, it sees the most action of all the guitars I own. I'm getting ready to order another one soon... an all koa DC127. Eventually I would like to pick up a CT6. I did replace the stock pups, but I will say that the stock pickups sound better split in any other humbucker I've owned. I've been to their store/factory in SD a few times, and the guitars are really built nicely. They keep costs low because of being direct. The california carve tops were beautiful and played great. The only thing I didn't like was their pickups but thats an easy fix. The customer reps were also very friendly and no pressure. I've only gotten to play one Carvin, and it was absoflippinlutely amazing. Lowest action with absolutely NO buzz that I've ever played. imho, of course, ymmv, & etc. 1 - I bought a used Carvin Strat. Great look, great construction / parts quality, but sounded thin. I sold it because of the tone. It was also very inexpensive which speaks to the lower resale value. 2 - I ordered a custom built Carvin about 6 years ago. When it arrived the tremolo arm was loose in the case and had slid around in shipping -- scratched the crap out of the guitar. The guitar has also been dropped (before shipping) and had a deep crack and dent in the clear coat. They refunded right away, but I was out $100 for shipping. It also speaks to their careless handling / shipping of product. I did play the guitar -- same concern as above -- sounded very thin. I did not get another one. Carvins are amazing. Pure and simple. My only issue is the necks are too slim for my purpose. Don't buy a bolt thinking its a strat........... That's all I have to say about Carvin, their strat look-alike sounds nothing like a strat. And, hilariously, everyone on the board swears angrily that they all sound like Stevie's #1. LOL those sad, silly little people. Just don't try to sell one used. Poor resale value unfortunately. Although I have had a good experience with Carvin, I have agree with Gary: Completely different league. I would pay the "extra grand" for the PRS McCarty. That's the rub. I'm sure I would have bought a Carvin years ago if they offered a fatback neck profile. I know you get a fatter neck with the Holdsworth but that model just doesn't do it for me. I've heard the same comment often enough to be convinced Carvin could increase their market share just by offering a couple of different neck profiles. First of all, a PRS is a PRS and a Carvin is a Carvin. You cannot buy one and expect it to sound like the other. Yes, the CT6 will sound similar to a Les Paul or a PRS because it uses similar woods and construction methods, but they would sound identical. Another thing to consider- no guitar (or company) is for everyone. Personally, I love my DC127. It is extremely versatile and a joy to play. The neck has a nice shape and the action is super low, without buzz. The quality in construction is second to none, IMHO. 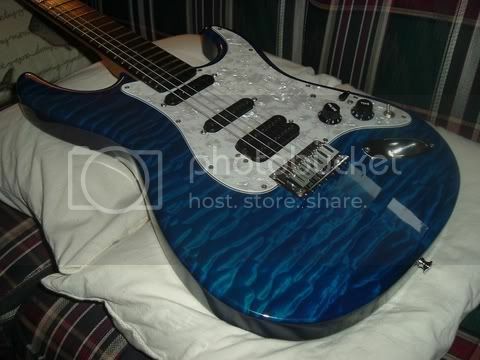 I am currently specing another Carvin- one that will be based on all the things I really want in a shred style guitar. I have owned two Carvin amplifiers- a Legacy and an MTS 100. Booth had to go back (for separate issues). The Carvin CS guy was very helpful and there were no questions asked.